With nothing worth stopping in for I got out straight after tea reasoning I might as well sit in the sun with a couple of rods out as anything. With the radio I took my time setting up. 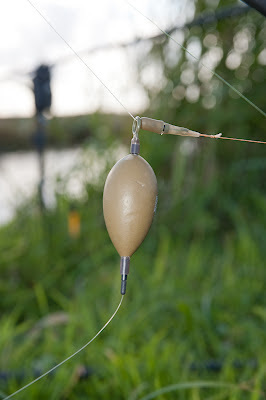 The rudd head section was cast out to the right on the long leger link usual rig and two dendrobenas went out on a Bellars-type rig. The bad is that the set up I was using tangles with soft hook links. I don't know if it tangles and stays tangled or if it unravels when you get a take because I've not had a take on it. I always hated the rig for pike fishing, so why I'm trying it for eels is one of life's great mysteries. I think it's because eel anglers seem to rate the more complicated Dyson rig. There is a way to avoid the tangling. I'll make the alteration next time I give the rig a go. If there is a next time! Not expecting anything until the light started to fade I spent my time shivering in the cool wind and watching swallows and martins hunting in a large flock over a hay meadow. Their aerial agility at the speeds they fly is amazing. Some came close and I could hardly track them as they twisted and jinked over the water. When they congregate like this it's a clue that autumn is getting closer. The reddening berries on the hawthorns are another. It's a funny thing, that when fishing a spot a couple times a week I don't notice the changes taking place but if my visits are a couple of weeks apart they are obvious. It's like the way you don't notice close friends ageing, but people you see once a year look much older every time you see them. So it was that as I watched the reed warblers busily working through the reeds I realised the chiffchaffs weren't singing. Maybe it was the wind ruffling the water or something else that stopped the small fish topping. There wasn't much surface activity at all, just a few marginal bubbles to give me hope that eels might be active. The moon, nearing full, was in the sky well before the sun had set. The good was that the first run, and it was a run, came to the deadbait well before dark too. More importantly I landed the eel. A small one of around a pound. I had hardly settled back in the chair after recasting when another run developed to the same rod. I landed that one too. The second eel was a bit smaller. After missing a third take to the leger I swapped the hooklink on the Bellars to a toothproof one and hooked on a rudd tail. One more missed run to the bottom bait a few minutes after the third was my lot. Not quite a hectic session, and no big fish caught, it still restored my confidence. Was it the fresher baits or the choice of swim that saved me from a third successive blank? Perhaps it was the moon?